Key result: Leave it, aerate it or turn it? If canola in the bin is dry and cold coming out of winter, then just leave it be. But monitor the temperature, watching for any rapid increases. Have a plan to move the seed if an issue arises. 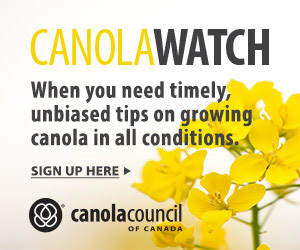 Producers are storing increasingly more canola in bins during the summer months due in part to year-round delivery contracts, growth in markets and production, and increased bin capacity. Determining the best management practices to maintain proper temperature and moisture in the bins during the Prairies’ hottest months is required to minimize the risk of spoilage, which could greatly impact total farm revenue. This project was a continuation of Joy Agnew’s 2014 study, which indicated that as outside temperatures go from cold in winter to warm in summer, leaving stored canola alone (as opposed to turning and aeration) resulted in the most stable conditions – provided the canola was cool and very dry (6 per cent). The objective of this project was to collect bin-scale data and to determine if canola with higher moisture content (9 per cent) should be managed differently when stored over the summer months or for longer periods of time. The temperature profile (grain temperature and relative humidity) in three 3,500-bushel bins with 9 per cent canola was monitored from June to August in 2016. For monitoring, each bin had three in-grain sensors on the sunny side, three near the edge on the shady side, three down the centre and one in the headspace above the grain at the top of the bin. One bin was left alone, one bin was aerated to even out the temperature distribution, and one bin was turned to even out the temperature distribution. To “turn” the bins, the research team pulled out approximately 400 bushels and put it back on top. This amount fits in a tandem truck and is enough to funnel the top layer of grain into the core of the bin. Other bins of varying size were intermittently monitored throughout the summer. In both years of the study, turning the bin at the beginning of June resulted in the lowest average bin temperature at the end of the monitoring period while aerating the grain in June resulted in the most uniform temperature distribution at the end of the monitoring period (refer to the table). However, both turning and aeration resulted in unstable conditions for a short period of time that may have resulted in condensation in the grain. Similar to results in 2014, leaving the canola alone resulted in the most stable and favourable storage conditions throughout the summer months, provided the canola is dry (<10 per cent moisture content) and uniformly frozen (to <-5°C) going into the spring months. 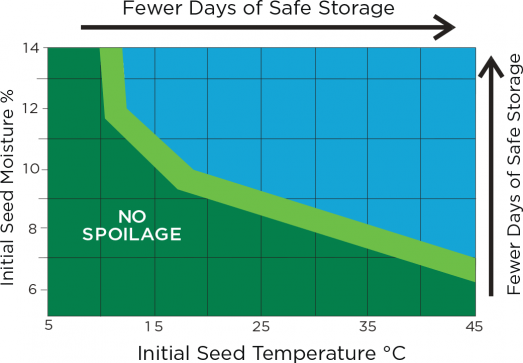 Agnew and her team recommend that growers, no matter what storage system they choose, continually monitor temperature profiles to ensure canola remains in good condition throughout the storage period. Key temperature indicators at the end of testing for both trials (°C). *Temperature gradient is the difference between the lowest and highest sensor readings.